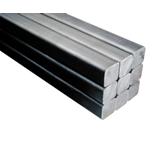 The square hot rolled billets are used in the manufacturing of medium-sized forged parts. From 65 to 230 mm. square side. Supply condition: without thermal treatment – stress relieved – annealed (sub-critical, spheroidizing, hyper spheroidized, isothermal (upon request) – normalized – quenched and tempered (under consult). “Rolled” or “ground” surfaces, upon request.